1 p.m. — Maria: Black Pottery of San Ildefonso Pueblo (30 min.) shows the famous potter making and firing pottery. 1:30 p.m. — Pablita Velarde: An Artist and Her People (1984, 20 min.). 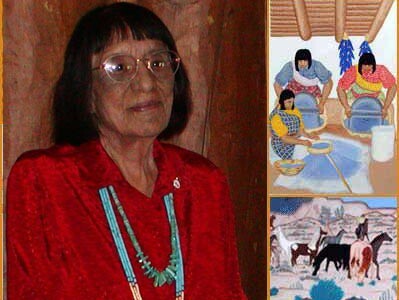 Meet Pablita Velarde, the noted Santa Clara Pueblo artist (1918-2006). Through her work at Bandelier National Monument in New Mexico, Velarde records the traditions and legends of her ancient people, so that future tribal generations may know and understand their heritage. Here we see Velarde mixing her own paints from natural, earth-found material, sketching in the wilderness, teaching young Indian children, and capturing on canvas, the essence of ceremonies, customs and present-day Pueblo life.